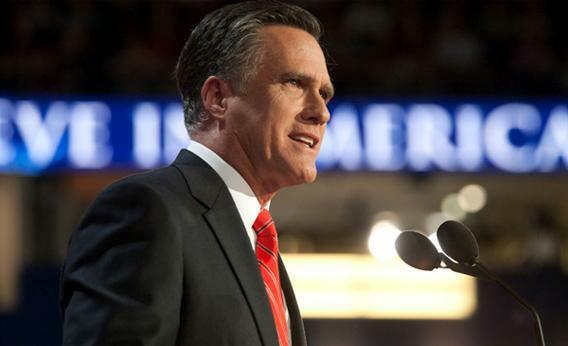 Romney’s convention speech: class warfare, the Obama economy, and other messages for the fall campaign. Romney’s convention speech is a preview of the fall campaign. Mitt Romney speaks on Thursday at the 2012 Republican National Convention in Tampa, Fla.
How does Mitt Romney plan to win the election over the next two months? He just told you. All his messages are laid out in the speech he delivered last night at the Republican convention. Here’s a review of the speech and a preview of what’s ahead. Every family in America wanted this to be a time when they could get ahead a little more, put aside a little more for college, do more for their elderly mom who’s living alone now, or give a little more to their church or charity. Every small business wanted these to be their best years ever, when they could hire more, do more for those who had stuck with them through the hard times, open a new store, or sponsor that Little League team. Every new college graduate thought they’d have a good job by now, a place of their own, and that they could start paying back some of their loans and build for the future. This is when our nation was supposed to start paying down the national debt and rolling back those massive deficits. This was the hope and change America voted for. It’s not just what we wanted. It’s not just what we expected. It’s what Americans deserved. this Obama economy has crushed the middle class. Family income has fallen by $4,000. But health insurance premiums are higher, food prices are higher, utility bills are higher, and gasoline prices have doubled. Today more Americans wake up in poverty than ever before. Nearly one out of six Americans is living in poverty. … His policies have not helped create jobs, they have depressed them. The numbers are familiar and will be vigorously debated. Romney will focus on the unemployment rate; Obama will focus on the number of new jobs created. But the key phrase tying it all together for Romney is Obama economy. Those two words, repeatedly paired, will burden the president with perceived responsibility for the weak economy, regardless of the extent to which he (as opposed to President Bush, Wall Street, Europe, congressional Republicans, or other factors) is at fault. You know there’s something wrong with the kind of job he’s done as president when the best feeling you had was the day you voted for him. The president hasn’t disappointed you because he wanted to. The president has disappointed America because he hasn’t led America in the right direction. … Americans have supported this president in good faith. But today, the time has come to turn the page. Romney’s message here is that you don’t have to be a hater or a right-winger to vote him out of office. It’s OK to like the president. And it’s OK, all the same, to fire him. 4. Business experience. Romney won the Republican primaries by running as a businessman, not a governor. Obama punished Romney for that approach, damaging him in polls by painting him as a rich, ruthless capitalist. In the general election, Romney had another option: He could contrast himself with Obama not as a businessman but as an executive, since Romney had been a governor while Obama, prior to his election as president, was never more than a legislator. Running as a successful state executive might broaden Romney’s image, highlighting his ability to help people, not just make money. I learned the real lessons about how America works from experience. … That business we started with 10 people has now grown into a great American success story. Some of the companies we helped start are names you know. An office supply company called Staples, where I’m pleased to see the Obama campaign has been shopping. The Sports Authority, which became a favorite of my sons. We started an early childhood learning center called Bright Horizons that First Lady Michelle Obama rightly praised. At a time when nobody thought we’d ever see a new steel mill built in America, we took a chance and built one in a cornfield in Indiana. Today Steel Dynamics is one of the largest steel producers in the United States. These are American success stories. Romney is betting that the success stories he can tell from his years at Bain Capital will outweigh the failed investments and tragic layoffs that were hammered by Democratic ads. The political rationale for making this bet is that Romney can heavily outspend Obama on TV ads for the next two months. The risk is that the stories of failure, outsourcing, and layoffs may have sunk into voters’ conscience in a way that no success stories can undo. The message isn’t just that taxes and regulations hurt the economy. The message is that even Obama’s rhetoric hurts the economy. The phrase “attacks success” conflates Obama’s words with his deeds. It implies that every time Obama complains about offshoring, portrays Romney as a cold-hearted capitalist, or suggests that rich people should pay more taxes, he’s discouraging business and slowing the recovery. Persuadable voters are unhappy with the lousy economy but aren’t sure what, if anything, Obama has done to cause it. At worst, they see his failure as incompetence. The “attacking success” message gives them a sharper answer. It attributes the weakness of the recovery not to bad luck or incompetence but to Obama’s ideology. And it creates a possibility that Romney can jujitsu Obama’s main pitch—that he’s the president of the middle class against the rich. If that possibility pans out—if Romney can make Obama’s message self-destructive by chaining it to the economy’s struggles as a causal factor—Romney will win the election. And this, in turn, could explain why Romney is doubling down on his decision to run as a businessman. The businessman image and the class warfare argument work together. They form a coherent narrative about how Obama harmed the economy, how he would continue to impede it, and why Romney can be expected to make things better. We are a nation of immigrants. We are the children and grandchildren and great-grandchildren of the ones who wanted a better life, the driven ones, the ones who woke up at night hearing that voice telling them that life in that place called America could be better. They came not just in pursuit of the riches of this world but for the richness of this life. Freedom. Freedom of religion. Freedom to speak their mind. Freedom to build a life. And yes, freedom to build a business. With their own hands. This is the essence of the American experience. That’s a very well-constructed appeal. It links the interests of poor strivers to the interests of thriving industrialists. It links social conservatives not just to economic conservatives but to libertarians. It broadens the GOP demographically, welcoming immigrants of all nationalities to the party’s worldview. And it weaves these groups together to form a definition of America that’s cultural and conservative without being ethnic. That’s a straight-up, double-barreled betrayal of the GOP’s stated principles about fiscal responsibility, dependency, and the size of government. Will Romney get away with it? Probably. It might even win Florida and Virginia for him. The question then, for his party and his country, will be what kind of mandate and future he has won.